On January 8, 2010, OSHA announced that they developed two new videos for healthcare workers that feature training and guidance on respirator safety. OSHA's "Respirator Safety" video demonstrates how to correctly put on and take off common types of respirators, such as N95s. "The Difference between Respirators and Surgical Masks" video explains how they prevent exposure to infectious diseases. Respiratory protection has been and always will be important. We have seen time and time again how respiratory hazards, such as silica and asbestos – just to name two – cause severe injury and death. So if your employees are exposed to respiratory hazards it is imperative that they are protected from respiratory hazards. If you want to read the complete release, please follow this link. If you need help with your respiratory protection program please call us at Evergreen. In the 19th century the primary means of early transportation were walking, horse and buggy, river boats, and steam ships. During this time women were hard at work in transportation. In 1825 Rebecca Lukens found herself in charge of the Brandywine Iron Works in Pennsylvania upon her husband’s death. The iron mill was near bankruptcy when she took charge, but her management skills succeeded in establishing a valuable company producing boiler plates for ships and locomotives and later iron rails. The company was renamed Lukens Iron and Steel Company in 1890. Today, Lukens, Inc. is the oldest, continuously operating steel mill in North America. Throughout these early years women also improved transportation by developing improvements to saddles, stirrups, hitching devices, and mechanisms to recover sunken ships. Another early invention was a combined horse-detacher and vehicle brake, patented by Annie H. Chilton in 1891. The device allowed for the simultaneous application of the brake and release of the horse, which reduced the chance of injuries to drivers. U.S Transportation Secretary Ray LaHood today announced federal guidance to expressly prohibit texting by drivers of commercial vehicles such as large trucks and buses. Contained in DOT Order 3902.10, the prohibition is effective immediately and is the latest in a series of actions taken by the Department to combat distracted driving since the Secretary convened a national summit on the issue last September. "Our regulations will help prevent unsafe activity within the cab,” said Anne Ferro, Administrator for the Federal Motor Carrier Safety Administration (FMCSA). “We want to make it crystal clear to operators and their employers that texting while driving is the type of unsafe activity that these regulations are intended to prohibit." 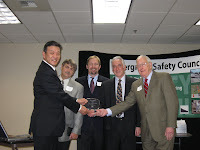 (Seattle, WA) – Evergreen Safety Council is proud to recognize Toray Composites America, Inc. as the 2009 recipient of the John D Spellman Safety Award. Evergreen Safety Council (ESC) has established this annual safety award in order to recognize member organizations who have demonstrated significant improvement or achievements in their safety program. The recipient is selected from applicants by an ESC Board of Directors committee and will be presented at today’s Annual Membership meeting. Established in 1992, Toray Composites America Toray Composites (America), Inc. is a leading producer of high quality advanced composite prepreg materials serving the needs of the recreational, aircraft and industrial markets. To learn more about safety training programs being conducted in the Greater Northwest, please view Evergreen Safety Council’s web site at http://www.esc.org/. Working from an elevated location is part of many of our jobs. Often the circumstances require the used of powered, elevating work platforms in the form of a scissors or boom supported personnel lift. These are wonderfully versatile devices and provide a safe way for us to work elevated, and in compliance with applicable safety rules and regulations. However, creativity can sometimes compromise our safely. The ASME standards for elevating work platforms all state that all occupants feet must be on the platform floor. No climbing on the guard rails or using other devices such as this ladder, is permitted. What caused this operator to take this risk? Was the machine’s elevating ability damaged or inoperative? If so, the machine should have been taken out of service until properly repaired. Fall protection as specified by the manufacture is required to be used by all occupants. The guard rails in the application provide the necessary fall protection. Being on the ladder shown, certainly takes the worker out of the protective envelope provided by the guardrails. Work smart, work SAFE, don’t use powered equipment that is damaged, defective or not functioning as designed. If you have employees who operate aerial or scissors lift equipment, contact Evergreen Safety Council for information regarding training of your operators. These Facebook pages have albums of pictures from the different motorcycle classes that Evergreen offers, including albums for Motorcycle, Scooter, and Sidecar/Trike classes. We hope that future and past students, as well as anyone interested in riding will become fans of these pages so that we can interact, keep in contact and share our motorcycle interests. So check out the motorcycle program pages, become a fan, and post a picture of your current or past motorcycle ride. Are you a member of ESC? Are you interested in finding out how ESC's programs can help your company's morale, keep your workers safe, and improve your bottom line? Then join us next Tuesday, January 26th at our Annual Membership Meeting & Luncheon. Full Luncheon Buffet: Three types of pasta, green salad, garlic bread, and dessert. Got a dry well that your employees do confined space entry into? If you do, is the air monitored (yes, in a dry well). On January 12, 2010 OSHA announced that it had completed inspections prompted by a June 29, 2009, triple fatality at a Jamaica, N.Y., recycling facility. An employee of S. Dahan Piping and Heating Co., of South Ozone, N.Y., was fatally overcome by hydrogen sulfide gas while cleaning a dry well at Regal Recycling Co. Inc. The owner of S. Dahan Piping and Heating, who was also the worker's father, and a Regal Recycling employee also succumbed while trying to rescue him from the dry well. OSHA's inspection found that S. Dahan Piping and Heating should have monitored the air quality in the dry well to determine if there was a lack of oxygen or the presence of another breathing hazard before any of its employees entered the dry well to perform their duties. If a hazard was found, protective measures would need to have been implemented prior to employee entry. OSHA defines a confined space as a space that has limited or restricted access of entry or exit, is large enough for a worker to enter and work in, but is not designed for continuous occupancy. Regal Recycling failed to post signs warning its employees of hazards that may be present in a confined space, such as the dry well. To read the compete press release, go to this link. Research shows that nearly 6,000 people died in 2008 in crashes involving a distracted or inattentive driver, and more than 500,000 were injured. On any given day in 2008, more than 800,000 vehicles were driven by someone using a handheld cell phone. U.S. Transportation Secretary Ray LaHood and National Safety Council President Janet Froetscher announced the creation of FocusDriven, the first national nonprofit organization devoted specifically to raising awareness about the dangers of distracted driving. FocusDriven’s new website hosts information on distracted driving and ways to get involved in the project. The U.S. Department of Transportation (DOT) recently launched a federal website with comprehensive information on distracted driving and a national PSA, featuring Secretary LaHood, to raise awareness about this dangerous driving behavior. Road construction is a year-around proposition here in the temperate climate of the Pacific Northwest. As such we need to be aware of the road construction projects underway on the roads we frequently travel. Yes, there are various traffic controls out there to help us avoid trouble, and often there is a flagger to regulate the flow of traffic through the construction zone. But, how often have we found ourselves reacting in a negative way to the delay caused by the construction? Worse still, when we become distracted by the pressures of the day, and perhaps have attempted to use our cell phones to salvage some productive time during the delay – further distracting us from the primary job of safely driving our vehicle? I am not sure that’s what this driver was doing, but the story goes that several lane markers and the frantic attempts to get the attention of the driver by the flagger on duty were ignored with the results being at least costly to do-over and at best very embarrassing. How’d you like to fill out the insurance claim on this event? If your company employs flaggers for traffic control, your flaggers must have on their person, current, un-expired documentation that they have been trained. Flagger information and class schedules, as well as information on becoming a flagger instructor is available on the Evergreen Safety Council website. Get trained, don’t let something like this happen at your construction project. The American National Standard for High-Visibility Safety Apparel and Headwear (ANSI/ISEA 107-2004) is a standard established by the American National Standards Institute, Inc.
Before the first publication of this standard in 1999, there was no regulation or specific guideline for the design and performance of materials for high visibility safety apparel in the U.S. Since 1999, private industries as well as various federal, state, and local authorities have recognized the ANSI/ISEA 107-1999 standard. Historically, the Manual on Uniform Traffic Control Devices MUTCD (by the U.S. Department of Transportation - Federal Highway Administration) focused on visibility from the driver’s perspective: the use of traffic cones, drums, and signs to provide motorists with visual cues and clear channels of travel. Until the release of the 2003 edition where the ANSI 107-1999 was first introduced as a standard, the MUTCD provided only general guidelines for workers visibility in work zones. The guidelines introduced in the 107-1999 standard have since become more explicit in the new 107-2004 standard. The American National Standard Institute, Inc. has broken down these specific guidelines into classes, and parameters that need to be addressed. These parameters include design, requirements for background and combined-performance for retro-reflective materials, photometric and physical performance requirements for retro-reflective materials and care labeling. Class 1 – Apparel for the use in activities that permit the wearer’s full and undivided attention to approaching traffic. Ample separation of workers from traffic and speeds do not exceed 25 MPH. Class 2 – Apparel for the use in activities where greater visibility is necessary during inclement weather or work in environments higher risks. Workers who perform tasks that divert their attention form approaching traffic or those with proximity to passing vehicles require a minimum of class 2. Class 2 is Washington State’s minimum for hours of daylight for flaggers. Class 3 – Apparel for the highest level of visibility for workers facing serious hazards and/or high task loads that require attention away from their work. Garments cover more of the body, such as arms and legs to differentiate the worker from inanimate objects such as cones and other traffic control devices. The combination of the Class2 garment and Class E pants equals a Class3 ensemble. The Federal regulation CFR 634 states that “all workers” (including towing companies, emergency first responders, media and law enforcement) within the right-of-way of a Federal-aid-highway who are exposed either to traffic or construction equipment within the work area SHALL wear high visibility safety apparel meeting Class 2 or Class 3. Since there are 975,000 miles of Federal-aid-highways it is extremely difficult to determine what is and isn’t “Federal-aid” so, many employers are opting to assume that all roads are covered under the regulation to avoid inadvertent noncompliance. We normally don't post two items in one day, but this is timely and important...We encourage you to add your ideas and tips in the comment section. As I write this article, the news media is flooded with reports from the January 12th earthquake that devastated the island nation of Haiti. Sadly, we may never have accurate information regarding the toll, both human and financial, of this event. At this moment, speculation runs the full spectrum from bad, to worse, to unimaginable. For those of us who live in the Pacific Northwest, the heart breaking images flickering across our television screens strike very close to home. Earthquakes are a fact of life – actually almost a daily occurrence – for those of us who live along the Pacific Coast, and many of us have vivid memories of our own experiences during the recent earthquakes. Check out http://www.pnsn.org/recenteqs/ for an up-to-the-moment depiction of earthquake activity in the area. The question is: what have YOU done to reduce the effect of an earthquake on your family? In 1983, FEMA established a comprehensive Earthquake Education Program under the authority of the National Earthquake Hazards Reduction Act of 1977. The intent of this FEMA program include increasing awareness of earthquake hazards and encouraging everyone, both individuals and businesses, to get involved in earthquake preparedness and hazard reduction. FEMA has published lists that summarize some recommendations for increasing earthquake preparedness actions at work, school, and in your home. · Identify an alternate location to conduct business if your primary facility is structurally damaged and can not be occupied. · Protect computer systems and personal computers against damage and loss of data as a result of ground shaking and power outage – surge protectors, earthquake straps, regular back-up of data and possibly off-site storage of those back-ups. Parents need to talk with their school district administrators to learn about the “seismic safety” of school buildings (have they been evaluated?) and encourage the district to improve the ability of school buildings to resist ground shaking without total or partial collapse. In addition, school districts should develop an earthquake safety program. · Inform parents about plans to care for students during and after a major earthquake – parents should provide their children with a personal 72 hour kit. · Encourage the training of school personnel in first aid, CPR, search and rescue techniques, and building safety procedures, such as turning off damaged utilities. There is a great deal of useful information on the FEMA website, we encourage to become informed and take action. Airborne Infectious Diseases - Airborne infectious diseases such as tuberculosis, severe acute respiratory syndrome (SARS), and influenza can be spread from person-to-person. OSHA is interested in protecting the nation's 13 million healthcare workers from airborne infectious diseases. Occupational Injury and Illness Recording and Reporting Requirements (Musculoskeletal Disorders) - OSHA is proposing to revise its regulation on Recording and Reporting Occupational Injuries and Illnesses (Recordkeeping) to restore a column on the OSHA 300 Injury and Illness Log that employers will check when recording work-related musculoskeletal disorders (MSDs). Crystalline Silica - Inhalation of respirable silica dust can cause lung disease, silicosis and lung cancer. Combustible Dust - Combustible dust can cause catastrophic explosions like the 2008 disaster at the Imperial Sugar refinery that killed 14 workers and seriously injured dozens more. Hazard Communication Standard - Global Harmonization System of Classification and Labeling of Chemicals - OSHA and other U.S. agencies have been involved in a long-term project to negotiate a globally harmonized approach to informing workers about chemical hazards. Beryllium - Beryllium is a lightweight metal that has a wide variety of applications, including aerospace, telecommunications and defense applications. Walking / Working Surfaces - Subparts D & I - This proposed standard will update OSHA's rules covering slip, trip and fall hazards and establish requirements for personal fall protection systems. To view the complete press release, check here. The omnibus bill to eliminate boards and commissions has been introduced in the house. (It is HB 2617). Section 151 eliminates the Motorcycle Safety Education Advisory Board and Section 157 eliminates the Non-highway and Off-Road Vehicle Activities Advisory Committee. The Motorcycle Safety Education Advisory Board was created by law to help the Director of the Department of Licensing manage the motorcycle safety program. Three active motorcycle riders or people actively involved in a non-profit motorcycle organization that actively support motorcycle safety. One member of the Washington State Patrol with at least 5 years’ experience, and at least 1 year’s experience as a motor officer. One member of the general public. Board members serve a 2-year term of office, and receive no compensation for services, except reimbursement for travel expenses while engaged in business of the board. This board is self supporting and requires no funding from the state budget. This board advises or offers opinions to the Coordinator of the Washington Motorcycle Safety Program (WMSP) to help support or improve motorcycle safety training in the state. The elimination of this board accomplishes nothing for the state budget and only hurts the process for providing motorcycle safety training. Please visit Driven to Distraction Task Force for all of the latest media stories regarding the legislation and press conference. The media has been overwhelmingly supportive of the legislation. Today marks the the first day of the legislative session in Olympia. A hearing for the cell phone bill is scheduled for 1:30 p.m. Wednesday, January 20 in the Senate Transportation Committee. Stay tuned this week for more details, including specific calls-to-action on House Bill 2635. Thanks again for your support. We're off to a great start of session thanks to each of you! Even though it is a typically rainy, January day, one coping technique for surviving winter in western Washington is to think ahead to those warmer and drier days to come. When spring finally arrives, many of us will be thinking about yard work. And those of us who use heavy powered equipment may be tempted to creatively adapt that equipment to facilitate the job at hand. Since certification of crane operators is now a requirement for cranes used in construction, this photo illustrates several safety issues. The web-sling rigging appears to be attached low on the mower: what is the center of gravity for this load, and could it overturn? The ASME standard requires that personnel only be elevated in approved personnel baskets, equipped with appropriate fall protection, and only if no other means is available or practical to access the specific location. At minimum, the manufacturer’s requirement that the equipment – both the boom truck and the mower – be used only for the purposes for which it was designed, is being violated. In the past the Federal Highway Administration (FHWA) concentrated most of its safety resources on improving the roadway-driver environment more than pedestrian and bicyclist environment. Reducing pedestrian fatalities and injuries now is one of the FHWA Safety Office’s top priorities. The FHWA’s new approach is not only provide roadway engineers and agencies with the tools and resources they need to improve the roadway safety environment for foot and bike traffic but also include education and an outreach program. This is a three-pronged strategy: (1) educate the public about safer behavior, (2) get drivers into the habit of watching for and yielding, (3) ensuring that engineers and planners accommodate for non-motorized traffic when they design roadways and other transportation facilities. These goals will take time to accomplish, until then we must take safety precautions for ourselves, families and friends. The Pedestrian and Bicycle Information Center website has many resources to assist in safe walking and bilking practices to educate ourselves. Wear retro-reflective materials and bright/light colored clothing and if using an umbrella use a brightly colored one. Stand clear of buses, hedges, parked cars or other obstacles before stepping into the street so drivers can see you. Stay sober; walking impaired increases your chance of being struck. Don’t assume vehicles will stop; make eye contact with drivers and wait until they show signs of slowing or stopping. The results of the latest observational seat belt use survey in Washington were released January 5th and show that Washington continues to have one of the highest rates of seat belt use in the United States. This year’s use rate of 96.4% is a slight dip from the 2008 use rate. "Increases in seat belt use have contributed strongly to drops in traffic deaths in Washington," said Lowell Porter, Director of the Washington Traffic Safety Commission. "There was a 31% drop in vehicle occupant deaths from 1986 to 2008 while vehicle miles traveled increased 34% over this same time period." In 1986, when Washington first adopted the seat belt law, seat belt use was at 36% and there were 528 vehicle occupant deaths, compared to 362 deaths in 2008. "We’re optimistic the number will continue on this downward trend," Porter continued. "Washington has set a goal of zero traffic deaths by 2030." Each year a nationwide observational seat belt survey is conducted. The 2009 survey in Washington comprised 87,946 vehicle driver and passenger observations. It was conducted statewide on a variety or road types following research protocols established by the National Highway Traffic Safety Administration (NHTSA). Studies conducted in Washington show that medical costs from crashes amount to more than $276 million each year in Washington. An unbelted vehicle occupant’s medical costs average $11,000 more per collision than those of a belted vehicle occupant’s. "Our high seat belt use rate is a reflection of the hard work of our law enforcement community," said Tom Robbins, Chief of Police in Wenatchee and Co-Chair of the Washington Association of Sheriff’s and Police Chief’s Traffic Committee. "Officers are willing to write seat belt tickets because they respond to collisions and see first hand that seat belts save lives and reduce injuries." The report shows that seat belt use is highest for people in passenger vehicles (96.8%) and SUV’s (97.3%), with vans rating third (95.5%) and pickups at (94.5%). "Prior to the adoption of the Click It or Ticket Project in 2002, seat belt use among pickup truck drivers was a full 10 percentage points lower than other vehicle types so we’ve made great progress in getting people to buckle up in their trucks," Porter said. An analysis by road type shows seat belt use is highest on state highways and interstate freeways and lowest on city streets and county roads. To view Target Zero, Washington’s Strategic Highway Safety Plan, click here. Hopefully, the few days of your new year has gone beautifully! If you are like most people, you may have even made a few “resolutions”. Studies show that 40-45% of Americans make resolutions every year, and at least one of those usually involves a promise to eat healthier and exercise more. Even though health related resolutions are made with the best of intentions, they often fail because people try to do too much too soon. (Certainly, if you attend the gym regularly, you notice the new crop of attendees every year that tends to dwindle after the first month or two.) People make promises to themselves that they are just not mentally prepared for or physically able to keep. While failure to keep these health related promises is disappointing, it also has the potential to be very dangerous or in rare cases, deadly. For those with cardiovascular disease, high blood pressure, diabetes or for anyone embarking on a new fitness program after being sedentary, it is imperative that before you begin any diet or exercise program you visit your physician to get medical advice and physical clearance. No one disputes the advantages of physical fitness. The trick is to start slow and make attainable goals. In general, to achieve maximum benefits, you should gradually work up to an aerobic session lasting 20 to 30 minutes, at least three to four times a week, but even just walking for 20 minutes a day has been shown to strengthen your heart and cardiovascular system, improve your circulation and help your body use oxygen more efficiently. What type of exercise can I do? Should I take my medication(s) at certain times around my exercise schedule? Do I need to take my pulse while exercising? What modifications should I make to my diet? If you are planning to turn your health around this year by starting a diet and exercise program, please begin safely by visiting your physician to discuss the proper course of action for you! Stay healthy and safe in 2010! On December 16, Dr. David Michaels, Assistant Secretary of Labor for Occupational Safety and Health (OSHA) delivered remarks to The NIOSH Going Green Workshop entitled Making Green Jobs Safe: Integrating Occupational Safety & Health into Green and Sustainability. Just a bit of information to make you realize that even in this economic down turn and the search for newer jobs, OSHA and DOSH will be there and we cannot begin to short cut safety.